Dentures can be a very accessible method to replace missing teeth. At Q Dental Mt Gravatt we offer a variety of denture appliances to replace several teeth at a time. Our dedicated prosthetist Peter Fuller is committed to ensuring your dentures are comfortable, affordable and durable. Our Mt Gravatt East dental lab allows us to provide detailed customisation and perfect colour matching. If your denture therapy requires teeth extraction or surgery we can see you at Q Dental Mt Gravatt. If you or a relative is unable to travel easily, ask about our pick-up car service. We can also arrange bedside visits where circumstances require. Dentures can be retained with dental implants, for comfort and stability. As few as two or four implants are necessary. If you’ve struggled with a loose-fitting denture and find it difficult to speak or eat with them, consider adding implants for support. 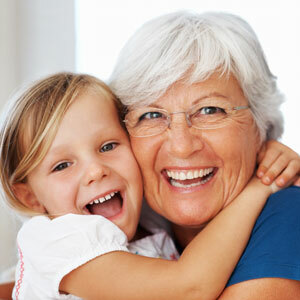 Our dentures are designed to look and feel as comfortable and natural as possible. Because we have an on-site lab, we’re able to create customised implant dentures that are often mistaken for natural teeth. It’s not necessary to have a dental implant placed for every single tooth that’s missing. Instead, we can use pairs or sets of implants to support fixed bridges. This approach prevents the need for more expensive treatments or removable dentures. Experience the freedom and confidence that dentures can offer. Schedule a complimentary exam with our Prosthetist to learn more. We’re open late and on Saturdays. Book an appointment.